A peer conference is small, attendee-driven, inclusive, structured, safe and supportive, interactive, and community-building. Most professional conference planners want to be responsible for large conferences–the bigger the conference the more lucrative and the greater the resulting professional status. Traditional conference organizers have a vested interest, therefore, in creating the biggest conference possible, a motivation that is not necessarily aligned with the best interests of attendees. If, instead, we focus on attendees’ best interests, a question then arises: How big should a conference be? We’ve seen that competing size-sensitive factors drive participant interactions. As the number of attendees increases, potential group knowledge and perspectives increase, but interactivity between participants decreases. If we are looking for the maximum amount of useful interactivity, then, ideally, we’ll want to have just enough attendees to provide a useful amount of group expertise and experience. I think it’s significant that, without prompting, a third of the people I’ve interviewed about their conference experiences said that they preferred small conferences, and when I asked them what they meant by small, they invariably gave me the figure of under a hundred attendees. I’ve been surprised and pleased by how well the peer conference format adjusts to the people present, whether there are 20 or 80. And so have the attendees. Am I saying that it’s impossible to create Conferences That Work with more than a hundred people? No. It’s perfectly possible to successfully extend the design, by creating multiple “mini-Conferences That Work” inside larger events. The crucial point to understand, however, is that good process for making meaningful connections with others doesn’t scale. You can’t expect to create the same level of intimacy over a couple of days with, say, a thousand people as you can with fifty. Unfortunately, a prepared conference agenda normally eliminates, or at best reduces, the likelihood of unexpected, impromptu sessions of “messiness.” Most people don’t possess the necessary mixture of on-the-spot chutzpah and charisma to successfully modify a conference program that has been carefully prepared and scheduled. Unless a conference reserves specific time blocks for attendee-nominated sessions and provides a workable mechanism for attendees to propose and choose topics, the event is very unlikely to depart significantly from its pre-planned course. I’ve found that half or more of attendee-desired conference topics are missed with a pre-planned conference schedule. Not only fruitful session topics but also optimum session modalities, such as tours, discussion groups, or impromptu workshops, get overlooked. A peer conference gives attendees the power and responsibility to drive what happens within a truly supportive, safe, and confidential process. This creates an environment so different from a pre-planned event that it has to be experienced to be fully appreciated. Treating conference participants as adults, able to ask for what they want and to offer their own wisdom and curiosity, frees people to be creative and take risks. In the process, the event expands to encompass the full range of possibilities asked for and offered by participants. Well before a traditional conference begins, the publication of the conference program confers status on the keynote speakers, presenters, and panelists. By the time the conference starts, attendees have already received the message that there are two classes of people present, those who will speak at the front of the room and everyone else, the listeners and receivers of the first group’s knowledge. During the conference, other class distinctions develop in the conference’s public arena: the people who ask questions at sessions, or who socialize with presenters outside the conference sessions. Predetermined conference programs send a message to attendees about their status in the conference community. The message is not explicit; it is fashioned indirectly by the program and the social groupings that emerge during public events, and it subtly affects the range of conference opportunities available to every attendee. Once conference roles have been introduced, they tend to be self-reinforcing. Presenters may spend time with each other, boosting each other’s status via their mutual association, while attendees congregate with their fellow attendees, discussing sessions from the perspective of a learner rather than a peer. The resulting barrier between the two groups, built by these predetermined roles, is surmounted only by attendees who are confident and extroverted enough to approach a presenter, or by those presenters interested in engaging with attendees outside of their sessions. In contrast, a peer conference supplies a structured process for determining conference sessions, while minimizing distinctions between presenters and audience. First, The Three Questions exposes individual attendee needs and expertise, providing detailed information on the interest, energy, and resources associated with attendees’ desired topics. Then, peer session sign-up provides clear indications of the sessions that people want to attend, resources for facilitation and expertise, and the information needed to optimally schedule sessions. These processes allow peer conferences to match participants’ needs seamlessly to available expertise session by session, avoiding predefined roles for attendees. To learn more about individual peer conference parts, start here. Traditional conferences with a pre-determined program and clear distinctions between presenters and attendees are certainly highly structured. But are they structured in a way that’s useful to attendees? Typically, a conventional conference starts with a formal welcome and logistical announcements. Unless they are trainings or workshops, traditional conference sessions tend to lurch from one topic to another. The conference is then usually ended by some kind of closing session. The event lacks a logical progression from start to finish; its structure is determined by logistical considerations rather than the needs of the participants. In contrast, I believe that it’s possible to provide a conference structure that encourages and supports participation, and to offer an environment where active involvement is the norm, rather than something for attendees to attempt unaided outside conference sessions. 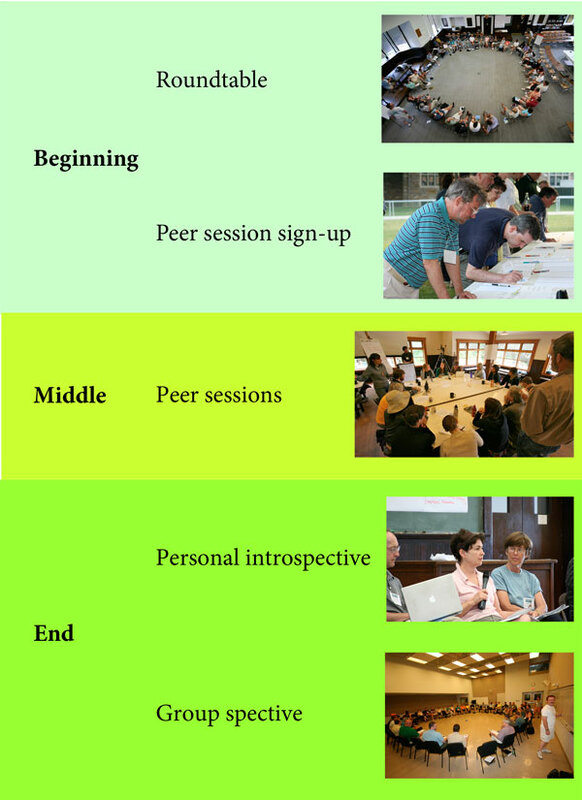 Consequently, a peer conference has a coherent structure with a beginning, a middle, and an end that are designed to facilitate meaningful and useful connections and interactions. The beginning of every peer conference is composed of two key sessions, The Three Questions and peer session sign-up. 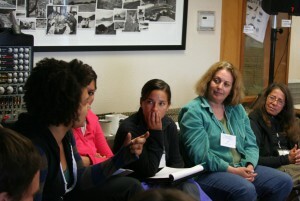 The first peer conference session, The Three Questions, serves three broad purposes. First, it defines and models an active, interactive, and safe conference environment. Second, it provides a structured forum for attendees to meet and learn about each other’s affiliations, interests, experience, and expertise. And third, The Three Questions uncovers the topics that people want to discuss and share, as well as indicating the level of interest in each topic. The Three Questions provides a structured, nonthreatening way for attendees to learn about each other early in the conference. During the session, people discover topics that interest others. They get a sense of the depth of interest in these topics, and they find out who has experience that they want to connect with and explore further. Peer session sign-up, held after The Three Questions, turns participants’ ideas, needs, wishes, experience, and expertise into a conference program that accurately reflects these factors. Peer session sign-up is a short three-part process (1) topic suggestion, (2) peer session sign-up, and (3) peer session determination and scheduling. The topic suggestion phase allows every participant to suggest conference session topics, and the sign-up phase provides a voting mechanism for attendees to choose the session they’d like to see. Finally, the information supplied is used to determine and schedule the most popular viable peer conference sessions. Typically, The Three Questions and peer session sign-up are in the afternoon and evening of the first day of Conferences That Work. In half a day, attendees learn about each other and develop a conference program that accurately reflects their true needs. The next morning, everyone is ready to delve into a conference that accurately reflects what the participants want. Most of the time that attendees are together is spent in the Middle of a peer conference: the peer sessions that attendees have chosen. The most popular session formats are discussions, presentations, and panels, but I’ve also seen workshops, tours, and simulations proposed. 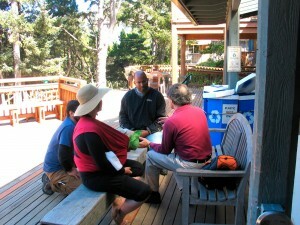 Unlike traditional conference sessions, peer conference sessions are informal. Because session topics are determined at the conference, subsequent presentations or panels are nearly always ad hoc events. But informal doesn’t mean disorganized. To support good process at peer conference sessions, all attendees receive a concise handout that explains how sessions work, and every session is assigned a facilitator. At a traditional conference, where the emphasis is on transferring information via fixed presentations, it’s hard to provide a meaningful closing event—there’s nothing to close. From this viewpoint, providing lavish banquets, award ceremonies, or celebrity speakers for a closing session are artificial attempts by traditional conference organizers to prop up attendance until the conference is officially over. At a peer conference we have an easier task. By the time that the last peer session ends, attendees have had significant opportunities to build individual and group relationships, leading to the creation of a conference community, a group of people who are bound together by their recent experiences together. A peer conference ends with two sessions, a personal introspective and a group spective. These sessions encourage attendees to take stock, reflect on where they started, the path traveled, and the journey yet to come. The personal introspective enables attendees to make this assessment personally, while the group spective, the last session of a peer conference, provides a time and place to make this assessment collectively. Traditional conferences have no overt ground rules. Attendees don’t get together at the start and agree on guidelines. This is an unfortunate oversight, but luckily, one that is easily remedied. Crucially, a conventional conference offers no expectation of or agreement to privacy for anything that is said. As a result, only the most confident or highest status attendee is likely to be comfortable revealing a lack of knowledge in some area, sharing a problem that he has, or asking a “stupid” question. Without a public group commitment to confidentiality, participants fear that what they say at the conference may make its way to their superiors or colleagues in their organization. This leads people to censor themselves on many topics. I have been amazed at what occurs at a conference when attendees agree to keep confidential what is shared. Giving people permission, encouragement, and a safe environment in which to express themselves and take risks makes a huge difference. It becomes easy and natural to ask important questions, reveal oneself, and be vulnerable, exploring beyond one’s habitual boundaries. Many participants find that taking risks can be rewarding, less scary than they’d imagined, and even fun. A peer conference starts by supplying a short set of agreements that define a supportive and safe environment. After these agreements are explained, attendees commit to them, establishing a secure and comfortable environment for what is to come. How can we best satisfy the desire for connecting with others during a conference? The answer is simple: rather than consign networking to an afterthought, something that happens outside the formal conference sessions, we need to move it to center stage—not as a replacement for sharing of content but as an essential, supportive tool for effective learning. And this needs to happen formally at the start of the conference, as an integral part of the format, so that the knowledge and relationships gained can be built on fruitfully throughout the event. What this means in practice is the addition, right after the opening welcome and housekeeping, of a new kind of session. This kickoff session first sets up a conference environment where sharing is acceptable and safe, and then provides time for participants to introduce themselves while simultaneously exposing topics and themes that people want to explore and expertise that others can draw upon. Such a session, The Three Questions, is held at every peer conference, where it sets the stage for everything that follows. Here’s what happens interpersonally officially at a peer conference: Participants discover and share the interests, needs, and knowledge of each attendee; the conference supplies tools for people to determine via a shared public space what will happen during the conference; attendees generate, staff, and participate in the resulting sessions; and finally, the conference provides group sessions for private and public individual and group reflection and future initiatives. Too much structure at a conference leads to excessive formality that gets in the way of conversations, while too little structure fails to generate the necessary level of personal information that attendees need to quickly engage in meaningful interactions. I’ve worked on observing and tuning this balance at Conferences That Work for years. Getting the mix right, sustaining it throughout the conference, and ending with sessions that integrate and enrich individual and group understanding creates a rich, productive stew of interaction and discovery that is largely absent from traditional conferences. Humans share a universal longing for intimacy, closeness, community, and excitement. We are accustomed to suppressing this longing during our day-to-day work activities. A traditional conference offers an opportunity to meet new people, but in a format that de-emphasizes human connection, with attendees sitting facing the same direction listening to others speak. But when conference process is built around attendee interaction, when the very shape and content of a conference is created by the attendees themselves via their active involvement, the whole feeling of the conference changes, becoming energetic, even electric. Friendships develop, community grows, ideas germinate and some flourish. When such a conference acknowledges, allows, and supports the deep desire for human connection, amazing things happen. In my experience, there are two prerequisites for this kind of connection to occur. The first is creating a conference environment that de-emphasizes potential hierarchical relationships between attendees. It’s hard to create deep connections if some attendees are in awe of or dismissive of others. The second is creating a conference environment that feels safe and encourages attendees to take risks. Such an environment encourages participants to pose questions they’ve never asked because they worried others would see them as ignorant, and promotes outside-the-box ideas and activities that energize attendees in exciting and innovative ways. Though peer conferences are not specifically designed to foster community building, they provide bountiful opportunities for people to meet, and to discover and build community in a meaningful way that works for each individual. The resulting community is organic, reflecting the true will and needs of the participants, rather than anyone’s preconceived agenda.